This seems like another attempt by the GOP to discredit the work that Clinton did as Secretary of State, especially in the context of her possible presidential bid for the 2016 election. It got me thinking, however, about time limits, if any, that political parties, experts, and even the public can place on criticizing policy when using hindsight. During a speech at the 45th Munich Conference on Security Policy in February 2009, Vice President Joe Biden told attendees that America’s relations under the new Obama administration were “rooted in a strong bipartisanship.” During the speech, Biden urged members of the audience to “press the reset button” and work with Russia. Among the examples that Biden gave as areas for cooperation were NATO missions, the war in Afghanistan, the conflict in Georgia, and nuclear weapons. Throughout the twentieth century, the relationship between the United States and Russia was characterized mostly by competition and conflict. The cold war nearly brought the two superpowers to blows, but with the collapse of the Soviet Union, the threat of a third world war had subsided. As the United States filled the role of the world’s lone superpower in the 1990s, Russia embarked on a rebuilding process. The abundance of resources such as oil and natural gas led to resurgence in Russia’s influence. As Russia exerted its influence in the region, the relationship with the United States under the second President Bush began to falter. After the conflict in Georgia during the summer of 2008, relations between Washington and Moscow “sunk to a new low.” With this in mind, the newly elected President Obama worked to improve relations with the Eurasian power. Fast forward five years, and given recent events in Ukraine, and in Crimea in particular, it is no wonder that the GOP is questioning the White House’s decision to hit the “reset” button in this tweet; however, we should ask ourselves why the GOP didn’t attack VP Biden in the tweet. If attacking White House policy were the goal of the tweet, then it would seem reasonable to call out VP Biden for the policy since he was the one who made the initial speech at Munich calling for the “reset.” (Maybe they don’t have a picture of Biden and Russian Foreign Minister Lavrov holding a “reset” button.) This leads me to conclude that the policy portion of the tweet is merely a smokescreen for the political part- discrediting Clinton as we get closer to 2016. At what point can we stop using hindsight to critique policies? 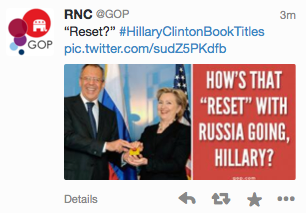 Yes, it appears now that the “reset” was not successful. At the time, however, in 2009, it seemed like sound policy. If we’re going to use what we know now to critique policy-making decisions and their outcomes, couldn’t we do the same to the GOP? Since the US aided the Mujahideen during the Soviet war in Afghanistan, and elements of the Mujahideen evolved into the Taliban, can we blame the GOP for supplying terrorists? What about US support for Iraq during the Iran-Iraq War? Within two years of the end of that war the US was going to war with Saddam Hussein, the Iraqi leader we had just supported. Again, can we say to the GOP that they made poor decisions, or do we conclude that they were the right decisions at the time and that we cannot predict the future?